Bhramari Pranayama is an effective and easy pranayama which facilitates the cleansing mechanism of mind from unwanted thoughts and negativity. This pranayama is highly recommended for patients suffering from headache, migraine, anxiety and other mental disorders. 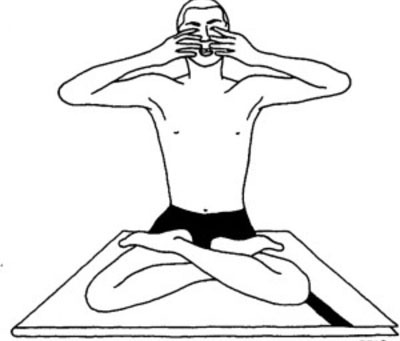 Bhramari Pranayama has derived its name from Black Indian Bee called Bhramari. By the significance of humming sound produced by the Black bee, this name has got its significance. We can understand the significance of Bhramari Pranayama from both spiritual scientific aspect. Bhramari Pranayama holds it’s great significance in spirituality. The power of humming sound resonates in body, mind and soul. The humming sound which is created during Bhramari Pranayama acts like a detoxifier, cleaning all negative thoughts from mind. If you want to seek within , then Bhramari Pranayama is right pranayama for you. It activates and channelizes higher level of energy centres that are important for spiritual growth. Crown chakra, forehead chakra, throat chakra and heart chakra are main chakras of higher level. These chakras are greatly channelized during Bhramari Pranayama. By the virtue of the humming sound produced during Bhramari Pranayama, the nervous system gets activated and all the toxins and blockages get released. This very effective process stimulates working efficiency of brain and helps in restoring inner calmess and peace. Moreover, the humming vibrations stimulate cerebral cortex of brain which sends impulses to hypothalamus and hypothalamus further stimulates pituitary gland which is the master of all glands. 1. Select a comfortable, peaceful place. 3. Gently close your eyes and keep the mouth closed and teeth separated. This facilitates more concentration of mind. 5. While concentrating on your Ajna chakra (forehead chakra), slowly inhale and produce a deep, stready humming sound during exhalation. 6. The sound should reverberate in the head. Feel the vibration in your head. 9. This is one round. One should practice it 11 rounds and then increase it simultaneously. 3. Do not overexert or over-pressurize your face and ears while practicing this pranayama.